Home › Insider › Archive by category "Shopping"
Been wondering where you could get great outdoor gear in the brands you love, while also shopping local? Then look no further! 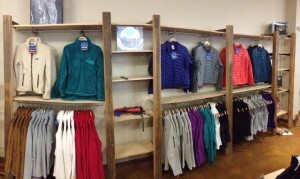 Brushy Mountain Outdoors is the new “it” shop of the Mooresville/Lake Norman area. Owners, Lee and Ale Warden, have truly brought something to the town that it had been missing! Lee and Ale have traveled all over the country on outdoor expeditions and have actually lived out west. With their shared love for the outdoors and having firsthand knowledge of the importance of reliable gear, they decided to open a store! While they loved being out west, they really wanted to bring this dream closer to home. They not only wanted to be closer to family, but also knew there were lots of wonderful places locally to do the things they love outdoors. Whether you are into hiking, running, camping, fitness, or simply looking for an awesome winter coat from a great brand, Brushy Mountain Outdoors has you covered. 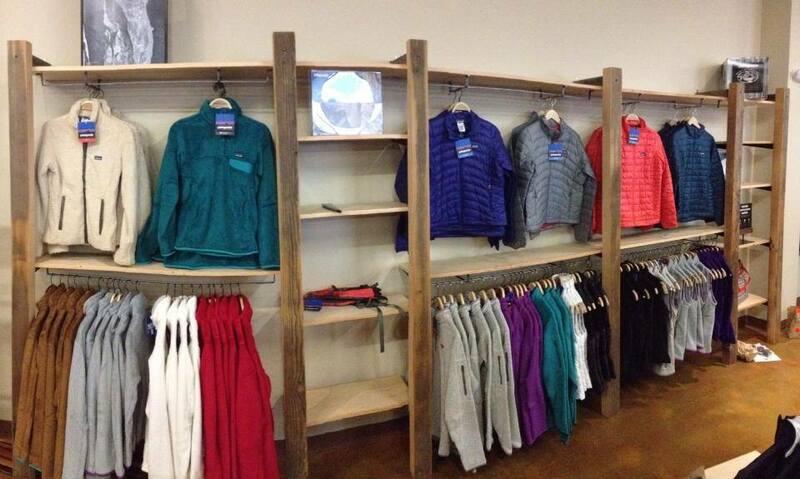 They offer the largest selection of Patagonia merchandise in the Lake Norman area, as well as other notable brands including; Mountain Khakis, Smartwool, Salomon, Pearl Izumi, PrAna and tasc. What could make a great outdoor store even better? A full service espresso and coffee bar! The Bean Stash Coffee Shoppe is located inside of Brushy Mountain Outdoors and offers customers a wonderful place to grab a cup of coffee, unwind, and enjoy complimentary wifi. The coffee beans are roasted in Durham, but are imported from all over the world. Kent Bennett is an experienced barista and will make whatever kind of beverage you are in the mood for! From clothing, to coffee, Brushy Mountain Outdoors is here to serve the Mooresville area and guarantee a great experience. 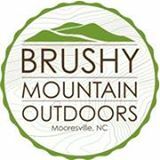 Whether you are looking for reliable merchandise for your next outdoor adventure, or simply after a great cup of coffee in a pleasant environment, head over to Brushy Mountain Outdoors! Also, be sure to say what’s up to their shop dog, Aspen, who will instantly welcome you into the store and make you feel right at home! 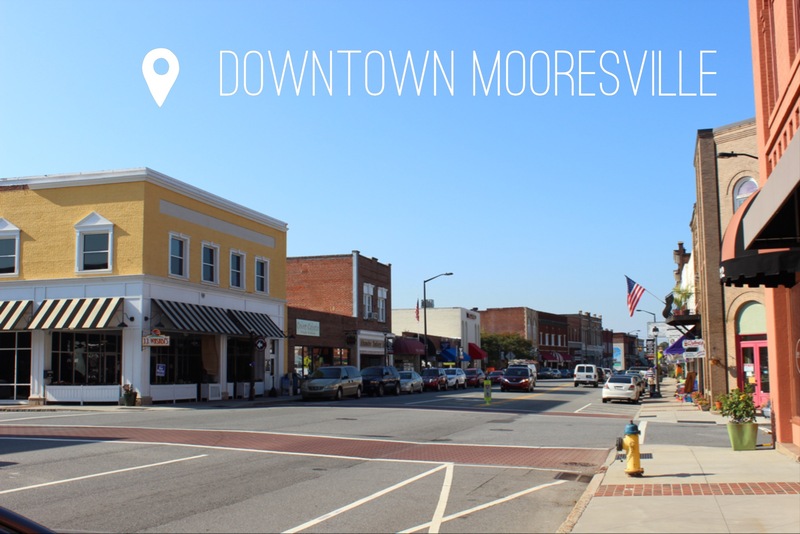 Downtown Mooresville is the perfect spot for a Sunday afternoon stroll. 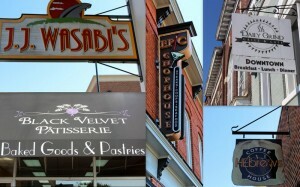 There are wonderful locally owned shops and delicious eateries to stop in and check out. With everything from quant coffee shops where you can read a good book, to candy shops that make a great place for kids birthday parties, there is truly something for everyone to enjoy! The downtown area has something to offer every type of shopper! If you are interested in finding something vintage and out of the ordinary, there are several antique shops. There are also several jewelry shops if you are in the market for one of the finer things in life! Boutiques are also a great place to stop in whether you are looking for something in particular, or not! You are bound to find something unique and you will enjoy your time just browsing the displays. List of Shops: 202 North Main Fine Wines, Ain’t Miss Bead Haven, Aisle Pawn Shop, Alexander Zachery Jewelers, American Classic Antiques, Anything’s Possible Custom Tattoo & Body, Big Hat Larry’s Guitar, Music, and More, Carriage Ride Antiques, Clippers Flowers of Lake Norman, Inc., Color Cabana, Copycat Kids Consignment, Cosmic Connection Arts& Interests, Cottage House Antiques, Cotton Ketchie’s Landmark Galleries, CVS Pharmacy, D.E. Turner & Co. Hardware, Distinctive Cabinetry & Design, Four Corners Framing & Gallery, Gibson Bros. Furniture, Hair of the Dog, Jewelers on Main, L Squared Boutique, Merle Norman Cosmetic Studio & Spa, Pearls Boutique, Thistle Meadow Wines, etc. Whether you are looking for a great place for a meal or simply looking for a relaxing place to enjoy a cup of coffee, downtown Mooresville has something for you! There are several wonderful wine shops, restaurants, coffee shops, bakeries, and a candy shop. 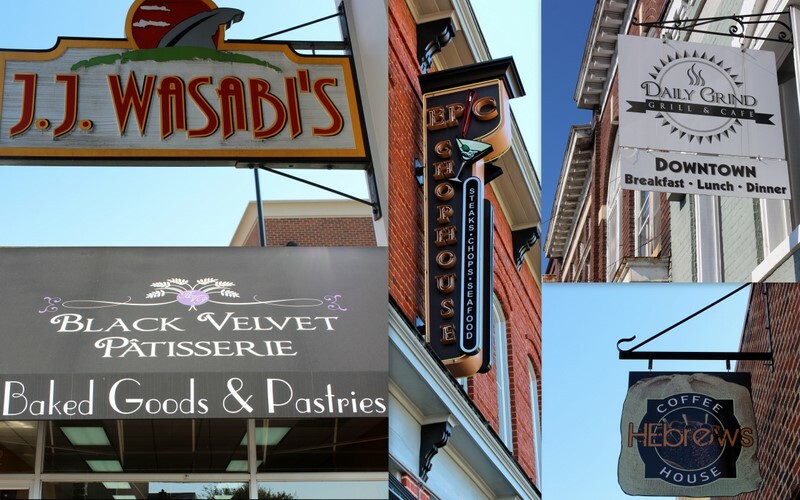 List of Eateries: The Bathtub Gin, Bob’s Grill, Black Velvet Patisserie, The Daily Grind, Epic Chophouse, HEbrews Coffee House, J.J. Wasabi’s, Mooresville Ice Cream Co., Pie in the Sky Pizza, Inc., Richard’s Coffee Shop, Sub Express, and Sugar Pop’s. There are public events held every week in the downtown area shops and eateries. Below are some of the events held each week, but be sure to check the downtown website, www.downtownmooresville.com, for the most recent list of upcoming events! One of the most popular events is the Farmer’s Market, which is held every Saturday morning from 8am-12pm. This is a great opportunity to purchase fresh produce at a great price, while also supporting local farmers. Each week there is a community music jam at Richard’s Coffee Shop, that is held on Saturdays from 9am-12pm. Every first and third Wednesday night of the month, 202 North Main Fine Wines has an Open Mic Talent night. On Thursday nights they have educational and fun wine tastings and live music is featured on Friday and Saturday nights. The Enchanted Olive has a tasting bar that allows guests the ability to try over 50 different olive oils, balsamic vinegars, and specialty oils. Yum! 1. Take a Stroll. When you have a free afternoon, check out the downtown shops and do some window shopping as you walk down Main Street. 2. Go to an Event! If you are looking for a fun event during the week or on the weekend, there is almost always something to participate in. From wine nights, to live music, to the farmers market, there is a function for everyone! 3. Shop. There are wonderful boutiques, antique shops, and jewelry stores to stop in! 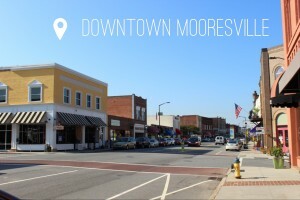 Check out our Video Insider on Downtown Mooresville! If you are looking for the perfect place to host a birthday party, bridal/baby shower, or are interested in having a candy buffet at your next special event, look no further! Sugar Pops is a quant, colorful little candy shop, and party host, located on Main Street in downtown Mooresville. With over 300 types of candy and 100 types of eclectic soda, Sugar Pop’s is the premier party spot in town! The variety of candy at Sugar Pop’s is unlike anything you have ever seen! There is truly something for everyone, whether you prefer sweet or sour, Sugar Pop’s has got you covered. The candy assortment includes; novelty, chocolate, individually wrapped candy, bulk wrapped candy, M&M’s, Jelly Bellies, gummies, nostalgic, and bulk unwrapped. Candy can be used at in-house events, candy buffets, and can be purchased individually when customers come in! There are 100 types of eclectic sodas available to wash down your sweet treats, or to simply have on their own! The soda selection includes; orange, Diet Soda, Cola, Kids, Jelly Belly, Eclectic, Cream Soda, Root Beer, and Cherry. All sodas are sold in glass bottles which adds to the experience and creates a little nostalgia for how soda use to be packaged. Candy Buffets are custom made and are designed specifically for each customer and their event. The buffets include your choice of candies, chocolate, M&M’s, Jelly Belly, a variety of glass and apothecary jars, the use of candy scoops/tongs, coordinated ribbon & custom candy labels, design & set-up and bags. The buffets are wonderful to have at weddings, showers, birthday parties, and other special events. Having a candy buffet at your event adds a beautiful display of colors and immediately allows guests to become kids again! 1. Host a Party. If you are looking for a great place to have a child’s birthday party or other celebration, Sugar Pop’s is a great place to host it. It is such a fun and cheerful atmosphere, guests will definitely have a great time! 2. Have a Candy Buffet! Candy Buffets are very popular at weddings, showers, and other events. It allows guests a great selection of candy that they get to choose from, beautiful glass jars, and ribbons and custom candy labels. 3. Stop in! The shop is open every day and is a great place to stop in while strolling down Main Street in Mooresville. You are bound to find your favorite candy and old-fashioned soda!